Ana Brzova and Viki Stoklasova won the 2013 APTA Women’s National Championship held in March at the Indian Trail Club in Franklin Lakes, New Jersey. 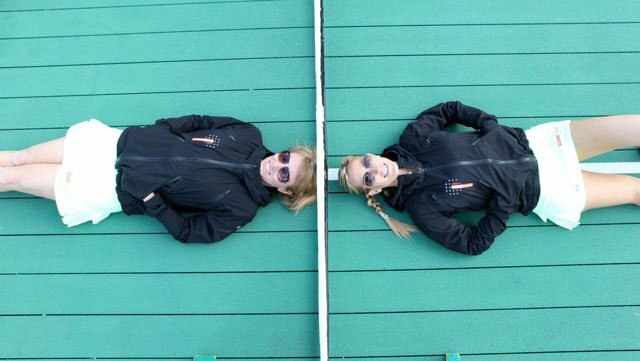 The 96-team tournament looms large because it brings together the world’s highest ranked women’s paddle tennis teams. When you win the Nationals, you’re pretty much it. The story of who Ana and Viki are, how they got to be National Champions and what that signals for both men and women in the platform tennis future makes a compelling narrative. Both women share an Eastern European heritage, Ana from Macedonia, Viki from Slovakia. Both demonstrated notable athleticism at an early age and both had extensive tennis training growing up. She continued to play, attending a Sports High School. After a year in college where she showed both aptitude and interest in chemical engineering, she decided to come to the U.S. entering the University of South Alabama to get an education and play tennis. The move proved beneficial as she wound up getting an MBA as well as plucking up a Division 1 Singles title. From Yugoslavia, Ana’s family moved to Moscow, Russia where she finished high school. She came to the U.S. and attended Iona College, starring in both sports. When she decided to obtain her MBA in Finance, she also took on the responsibilities of Iona’s Head Volleyball Coach. After a sojourn into the world of banking, she went back to tennis as a teaching professional. She also cultivated further her interest and expertise in the game of platform tennis. Viki and Ana’s ascent to the top spot of women’s paddle is unique because of its rapidity. Ana had her first introduction to the game some five years ago, Viki, three. They have only played competitively as a team for 2 ½ years. “I first was introduced to paddle at Flint Park in Larchmont. Mike Cochrane encouraged me to try playing the game,” said Ana. “I loved the game. Paddle for me is both competitive and social. There is great camaraderie. 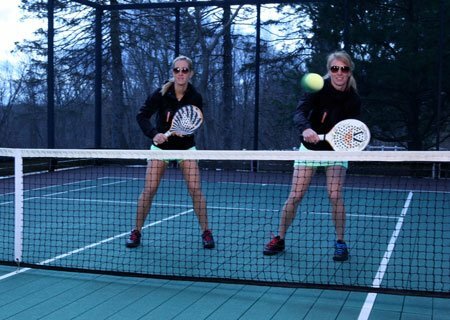 I was used to playing tennis where you would play, then pack up and go.” As an Assistant tennis pro at the Weeburn Country Club in Darien, CT, Viki had seen paddle tennis courts during the summer and wondered about them, but not significantly. As luck would have it she began to congregate with tennis pros from other clubs: Martina Ondrejkova whom she knew from her hometown; Ana whom she did not. Viki did play in the Connecticut Mixed with JP Johnson and finished third. In the spring, she teamed with Sebastian Bredberg to finish third in the Mixed Nationals. Then that Fall, Ana and Viki decided to become teammates and embark on a serious course of women’s tournament play. As they set out on their tournament path, they didn’t play consolation matches. Either they won or they were out. Both continued to play mixed tournaments through 2012 with Viki winning among other titles The Weston Field Club Mixed Member Guest. Taking aim at the 2013 Women’s Nationals, the ladies worked with Mike Gillespie of the Indian Trail Country Club of Franklin Lakes. “We figured out which shots were better for whom,” Ana said. One result was that they changed positions on the court, Viki moving to the ad side, Ana to the deuce. With the 2013 Women’s Nationals approaching, both players focused on playing well. “We didn’t think we would win necessarily, but we wanted and expected to be competitive,” Ana said. Looking beyond the more immediate plan of defending their National Championship, the women speculated on the future of platform tennis: where it is now and what it might look like ten years down the road. Viki and Ana agreed that both men and women’s games feature harder hitting. The women, however, appear to emphasize more anticipation and correct positioning versus the at times reckless and unpredictable blast and scramble of the men. Just how exciting is this new approach? Exciting enough to generate spectator numbers that will attract sponsors and grow the sport? The game clearly is in transition, its popularity spiking upward. It appears to be on the cusp of taking off, but where? In the same article, McDermott described the team of Herb Fitzgibbon and John Beck who dominated the 1973-74 season. “Their style was revolutionary, a slashing, powerful game, a deviation from normal strategy bred on patience and defense.” Sound familiar? And there was money injected into the sport, there were sponsors and a players’ tour organized. But somewhere in the 80’s and 90’s the game’s popularity hit the skids. The optimistic forecasts of the sport gaining mass appeal didn’t materialize. What will happen this time around? Ana and Viki have already played for paddle prize money (they took their winnings and entered a Beach Tennis Tournament in Florida). Both agree that it ups the level of competition. But both have reservations about full-blown efforts to “professionalize” the sport fearing that the positive balance between the competitive and the social so crucial to the essence of the sport will be lost. Reservations aside, both players acknowledge the explosive growth of talented converted tennis players, foreign and domestic, pouring into the paddle ranks. “We have more tennis teaching pros playing paddle, and I think it’s great that they enter with high level racquet skills,” says Viki. It is the sheer volume of talented performers that is different this time around, among both men and women. While the sport itself has not abandoned completely it’s country club cocoon, clearly it has become more egalitarian. Yes, money seems to surround it, but paddle tennis is hardly the sine qua non and sole domain, as it used to be, of Ivy Leaguers and the Eastern Establishment. There are more people playing, too. There are high school leagues and junior tournaments. Colleges are beginning to pay attention as well, with numerous programs being initiated at the club level. The ground swell is such that the rough and tumble of pay- to –watch- paddle may be on us again.